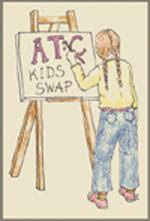 Objects Of Affection: Kids Artists Trading Card Swap! Hurry you must have your kiddos entered by this Friday 2/6! This looks really neat, I'll have to check it out!